Description: There's no rough stuff here--no punches or dangerous contact. In simple language, two senseis explain Aikido's vocabulary and technique to youngsters about to begin training. Full-sized photos of kids in action show basic, child-safe stretches, stances, and exercises, and show how to fall properly, do rolls, and practice grabs. Helpful tips assure that kids build coordination, flexibility, and strength--risk-free. The keikis will enjoy the book. 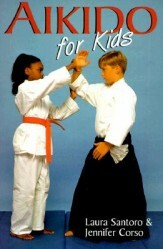 It\'s a quick read with plenty of color photos of kids performing some fundamentals in aikido. Should spark enthusiam or fuel the fire.